Buddha Day or Wesak is the second festival of the Buddhist Calender and celebrates the moment that the Buddha became ‘Bodhi’, Awake, Enlightened. For Buddhists and non Buddhists alike Buddha Day offers us the opportunity to contemplate the meaning and purpose of this human life by reflecting on the Buddhas resolve to attain Awakening and imagining what the Enlightenment experience of the Buddha might feel/look like to us. 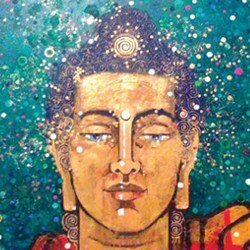 Buddha Day is also a great time to reflect on how we too can become more ‘Buddha-like’ ourselves. A day of meditation, puja, talks and discussion. Please bring a veggie/vegan lunch to share.